Double volume living or storage spaces offer clear opportunities for adding extra space. 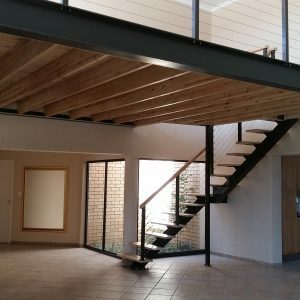 If you have an area in your home or workplace where the floor to ceiling height is 4500 mm or more, then we can create a suspended floor in this area, thereby adding floor space at minimal cost relative to the value added. Where a ceiling is lower than 4500 mm a suspended floor or mezzanine can be utilised for extra storage space. The methods that we use enable us to carry out these installations in most cases without the use of vertical support pillars, and also to hide all metal fixings used to secure the structure. This results in an installation that provides extra space with structural integrity and a pleasing aesthetic. 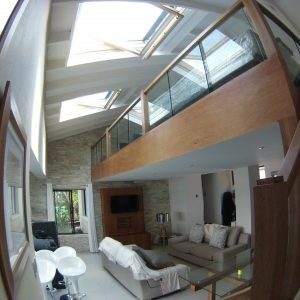 Mezzanine floors can be the solution to a number of space problems, effectively adding a new room which can be used for a study, bedroom or separate lounge for the kids.